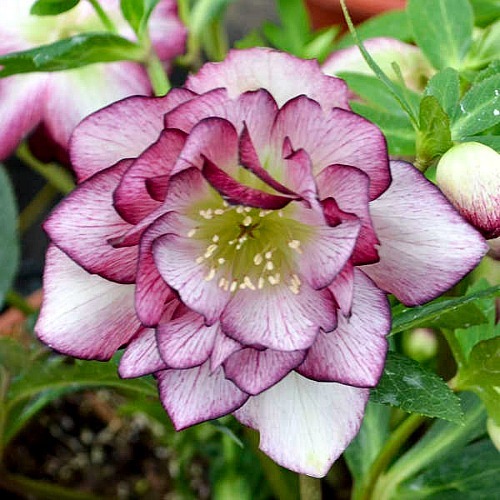 This award winning helleborus is just the perfect flowering perennial when you need a splash of color as you get weary of the long winter’s grip. The lovely nodding cup-shaped flowers herald the coming of spring and our bridesmaids look fabulous in their ruffles. In addition, the rich raspberry pink veining and matching picoted edges that highlight the abundant snow-white double blossoms is a magnificent sight to behold. In early spring, even before the last of the winter weather has departed, these lovely double blooms of helleborous Wedding Bells make an appearance to spread their bicolor splendor all round. The vigorous blushing bridesmaid flowers are fantastic with an upright compact form that’s perfect for container gardens, woodland areas, and early season indoor bouquets providing a view that you’re sure to love. It prefers humus-rich, well-drained soil and regular watering, and spent flower heads can be cut back to promote new foliage growth and to prevent too many volunteer seedlings. Many plantlets will form around the base of the parent plant and will bloom around the third year if left alone. Division is generally not needed but can be performed in early spring if desired.